My Life is Closed for Maintenance I Have Bed Bugs! 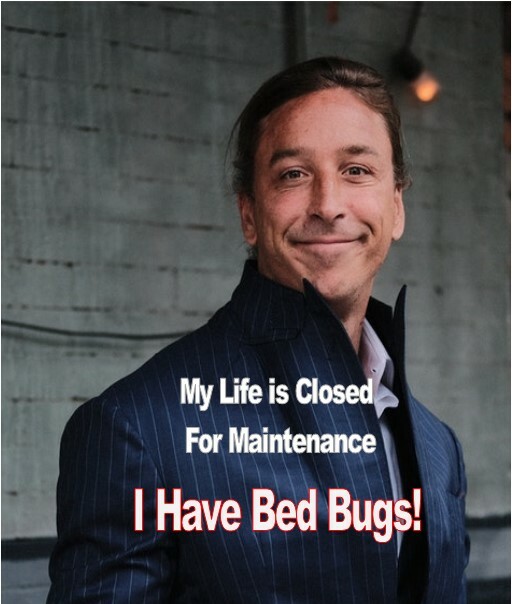 My Life – Closed for Maintenance – I Have Bed Bugs! Bed bugs are an unexpected nightmare that no one wants. They can show up at the most inopportune time. If you suspect bed bugs, you need to pay attention now. Or you’ll be wearing a sign that says, “My Life – Closed for Maintenance – I Have Bed Bugs”. You can get a flat or be playing softball and a misdirected ball may break a window. But unlike a flat tire or a broken window that are easy to fix in a day, bed bugs need time to end. But bed bugs can show up or dropped off at any time, anywhere without you ever knowing. Your time and energy need focusing. If you think or suspect bed bugs for any reason, stop what you are doing. Focus on finding out whether you have them or not. Meanwhile, you don’t want to have overnight guests or visitors that may put them at risk. So take a time out. And don’t play the “wait and see” game. A single bite doesn’t always mean you have bed bugs. But it is wise to investigate if the bites are coming from fleas or mosquitoes. Bed bugs are not always easy to find should you have only one or two of them. Their ability to hide supersedes your ability to find them. And they are difficult for even a trained professional to find during this time. After about a week after introduction, a scent has developed. It would be wise to bring in a detection dog team to find their scent. These trained dogs detect very small amounts of bed bugs. Even down to a single bug or egg and can target the area where they are hiding. So many people tend to think that if they throw away their bed, that bed bugs will be gone. They’re called bed bugs for a reason. They harbor in areas where we rest or sleep which are usually beds, couches or easy chairs. It is not always necessary to get rid of your furniture because of bed bugs. Especially when they are first introduced. People tend to do is reach for anything that says bed bugs on the label at their local hardware store or online. Using inferior products will create a whole new set of circumstances. Bed bugs have become resistant to most chemicals used for elimination. How would you know if you are dealing with a resistant strain? We can’t depend on chemicals – Concentrations of sometimes 1,000 times more is often needed – This would create a heavy toxic environment in our already toxic homes. Chemicals DO NOT kill bed bugs egg stage. Bed bug bombs spread bed bugs and do not reach their hidden spaces where bed bugs live. Most chemicals are “contact” killers. (sprayed on bug in order for the product to kill them). To kill resistant bed bugs, it may need concentrations of 1,000 times more than normal. Chemicals also leaves our environments toxic and makes some people ill.
High Success Rates – Bed bugs, like any living organism, has a thermal death temperature. Temperatures vary from 135°F to 180°F and success depends upon experience of operator. Find a bed bug. – Find signs of bed bugs. – Have a trained dog scent for bed bugs. If confirmed, decide on professional or DIY yourself. Weight the possibilities of chemical treatment versus heat treatment. What works in your environment? Do you have children, elderly or pets or a sensitive environment? Are there any immune system problems, breathing issues, COPD or Asthma? Is anyone allergic to chemicals? Treatment choices are up to you. Anyway, your life will be closed for a while until you get rid of the bed bugs. Have no shame or hide the fact you have them. They can happen to anyone.